Jackie Stewart's victory at the US Grand Prix set up a thrilling finale to the season with three drivers heading for the last grand prix in Mexico in with a shout of the title. Graham Hill, who came second, led the table by three points from Stewart with defending champion Denny Hulme a further three back. The presence of homegrown talent in the form of Mario Andretti and Indianapolis 500 winner Bobby Unser ensured a big turnout at Watkins Glen, while Stewart's prize of £8,300 was, boasted promoters, the richest prize in F1 history. Unser was hampered in the BRM by an injured ankle, the result of a charity basketball incident, while Andretti in a third Gold Leaf Lotus stunned everyone by putting the car on pole. 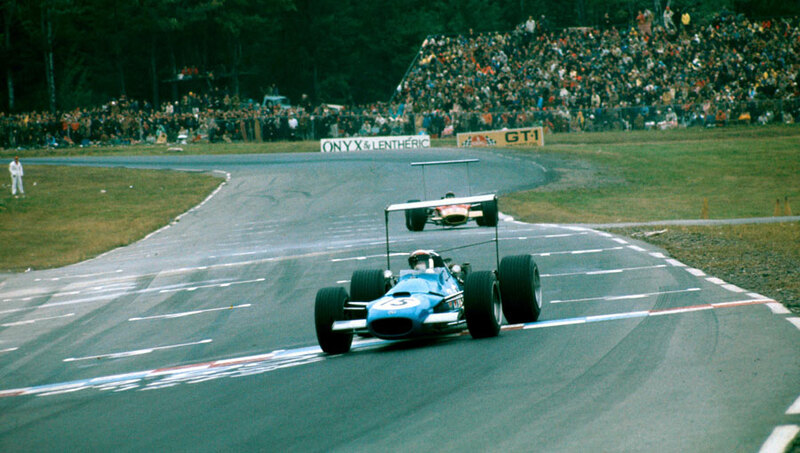 But Stewart in his Matra got the best start and soon stormed into a lead which was only once threatened, when he came round a corner to find two spectators crossing the track. "It's as close as I've ever come to running somebody over," he said. "I missed them by an inch." He set ten lap records during the course of the race. "It was the first time in my F1 career I felt I could dictate the pace," he said. "When I went faster, the field went faster. When I went slower, they went slower. It was an extraordinary moment of realisation." Hulme had a bad day and was well off the pace when he crashed on the 85th lap. Hill had to overcome a loose steering column but managed to retain enough control to take second place, while the perennially unlucky Chris Amon suffered a split radiator and Andretti stopped with clutch problems.